If you want to convert MOV to 3GP for playing on your cell phone, WinAVI All-In-One Converter is a good choice for you. This Video Converter is also a MOV to 3GP Converter that can convert MOV to 3GP with high quality and fast conversion speed. 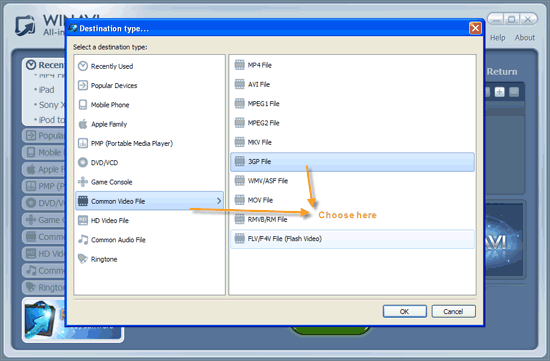 Here we take this program as an example to show you how to convert video from MOV to 3GP. Step1. Free download WinAVI MOV to 3GP Converter. Install and launch it. Step2. 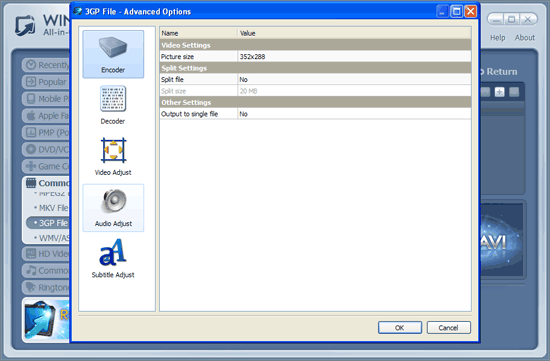 Click button to select MOV files or directly drag the file that you want to convert. Then you will be asked to select the target format and device as below picture, here we choose "Common Video File". You can also add more files by click the or on the interface. Step3. Click to personalize your 3GP output. Step4. When you finish it, click and you are ready to convert MOV to 3GP movies. 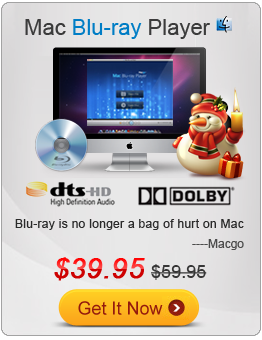 After you finish the final step, you are ready to playback your MOV files on mobile phone.